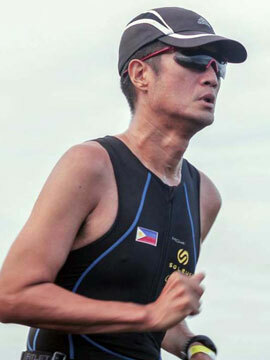 Alcorin, Cortel Get First Wins at MILO Roxas | JustRunLah! ROXAS CITY – First time winners Joel Alcorin and Cristen Cortel hugged the spotlight at the 41st National MILO Marathon Roxas qualifiers last Sunday at Robinsons Place-Roxas. The duo will lead the city’s qualifiers to the National Finals this December 3 in Cebu City. Alcorin finished the 21-kilometer race in 1:16:27 clearly ahead of chasers Rowell Hulleza (1:18:39) and Rene Desuyo (1:19:47). Before Sunday’s race, Alcorin’s best MILO performance was taking Second Place in the 2014 Bacolod qualifiers behind winner Maclin Sadia and ahead of Hulleza who took Third Place. Cortel topped the distaff side in 1:41:44 to cap a family celebration as several of her relatives also went home with honors. Lorena Blanco came in second at 1:44:16 while Cerila Cortel was third at 1:54:46. In the side events, the Cortel girls did well in the shorter distances with Mary Grace taking the five kilometers in 19:47 and Mary Gold the three kilometers in 12:16. Ramonito Cuabar (35:59) and Rodelyn Onato (45:59) were fastest in the 10 kilometers, Pernille Siason Jr. ruled the five kilometers in 17:41 while the three kilometers belonged to Jewel Ilorito in 11:03. There will be one more qualifying race in the Visayas next weekend with Iloilo City as host. From there, the MILO Marathon will proceed to Mindanao to hold more races in General Santos (October 15), Davao (October 22), Butuan (November 12) and Cagayan de Oro (November 19).